Come embrace this this one of a kind, meticulously maintained, two home compound & island paradise. Centrally located & nestled in the charming neighborhood of Little Venice. Just a hop, skip and a jump to the beautiful Atlantic Ocean. Perfect for entertaining - whether indoors or out, this property has it all! The main house upstairs features 2 bedrooms, 2 bathrooms with beautiful cathedral wood beam ceilings. For those who love to cook & host family & friends you will love this newly renovated kitchen, featuring a large island, granite counter tops, maple cabinets, stainless steel appliances, wine bar and walk-in pantry/laundry area. In the master bedroom enjoy ocean views from your private balcony & the master bathroom has been tastefully updated. Inspired by the love to entertain,the downstairs area along with outdoor space is perfect for hosting gatherings & making memories. The downstairs features open concept living, with custom built-in wall cabinets & separate bonus space currently being used as a home office. Step outside & into your very own island oasis - situated on an oversized lot, surrounded by lush & tropical landscaping. 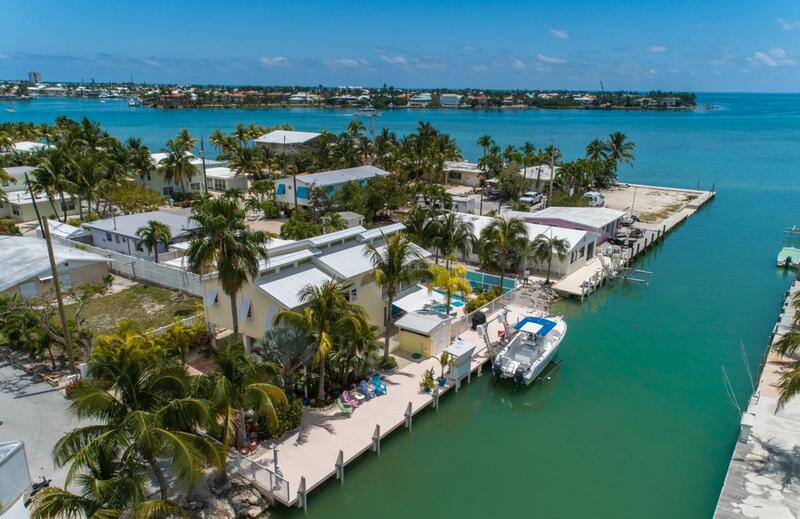 This outdoor space exceeds all expectations, with custom built bar area, saltwater pool & spa, 100ft of concrete dock, 14,000lb boat lift, fish cleaning station & a concrete storage shed for all your fishing& boating gear. Not to mention the exceptionally clean, flow through canal. Adjacent to the main house is a cozy 3 bedroom / 2 bath true Conch Cottage - perfect for out of town guests, in-laws or as an income producing rental property. This quaint cottage has been beautifully redone with coastal touches, large living room, open floor plan, and a beautifully renovated kitchen. Perfect location in the heart of Marathon close to shopping & restaurants. Direct access to the Atlantic Ocean and easy navigation to the Gulf of Mexico through Vaca Cut. Come view this unique property day or night to experience all it has to offer. You won't want to miss out! !